Here’s a quick tip to help you transfer photos to your computer from a digital camera quicker and more reliably. This advice applies whether you have an inexpensive point and shoot or an expensive DSLR. Instead of connecting your camera directly to the computer with a cable, take out your memory card and put it in a card reader. If your computer includes a built-in memory card reader, you already have everything you need. If you don’t have a card reader, you can buy one for about $15 or less. One of the reasons I recommend using a card reader is that it just takes a lot of the complexity out of the transfer. When you connect a card reader, it’s like you just added an extra drive to your computer, not a special camera device. The computer will let you easily view the files on the card just like any other drive, without trying to communicate with or control the camera. On Macs, some cameras like the GoPro won’t even let you directly preview images/video or remove files from the card when connecting the camera directly to the computer, because of the protocol used to communicate between the camera and the computer. Putting the card into a card reader allows you to access the card and have full functionality to transfer files, view disk space available, etc. While your camera works to transfer images to your computer, it may not be designed for the fastest transfer rates. Because card readers are specialized devices, they are engineered to maximize transfer speeds from card to computer. 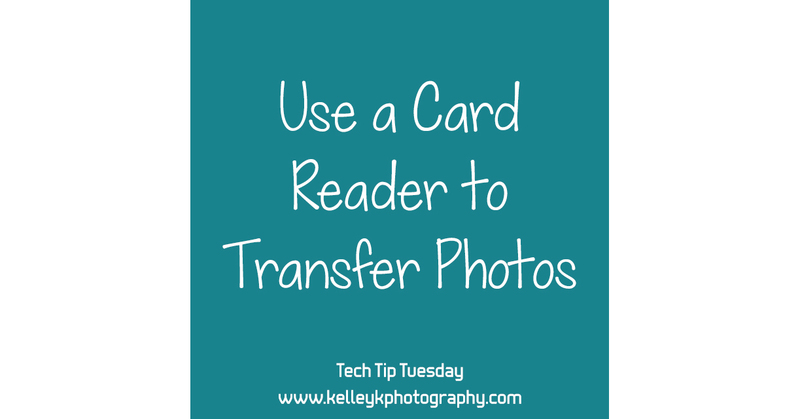 This can make a big difference when transferring a large number of photos, especially large photos and videos from modern digital cameras. The final reason I recommend using a card reader is that they are relatively cheap. If something goes wrong with one, they are easy to replace. I’d rather not use my expensive camera for a job a $10 card reader can do better. By using a card reader, I avoid putting unnecessary wear on the camera, both on the internal card reading mechanisms as well as the port where the cord is plugged in. Some computers have built-in card readers. If yours does and you are happy with it, you don’t need to purchase an external card reader. If you don’t have a built-in card reader, or if you feel your built-in reader is too slow, you can buy an inexpensive external card reader. When shopping for a card reader, look for one from a reputable brand and that supports USB 3.0. I don’t have a strong preference for specific models, but the card readers I use are from Transcend. I primarily use this Transcend Multi-Card Reader that reads Compact Flash, SD cards, and microSD cards. I also have this small Transcend SD Card Reader for SD cards and microSD cards. Using a card reader can simplify and speed up your workflow, while protecting your images and your expensive equipment. With the cost so small, why not try one?